Intel 14nm finFET SoC process is among the highlights of the 2015 VLSI Symposia alongside research that looks at the integration of III-V and 2D materials for future processes. The International Electron Device Meeting (IEDM) has once again provided a chance for the major chipmakers to go head-to-head with their latest processes - this time with finFETs. DVCon Europe brings design and verification insights to Munich next week. Intel aims to use a dual-pronged strategy that takes advantage of internet of things applications to push the x86 back into embedded-systems designs. Gold Standard Simulations has run simulations to work out how much of an improvement Intel's new rectangular shape represents. Despite the swirl of interest in the internet of things progress is likely to be held back by interoperability issues according to speakers at the recent NI Week conference. At DAC 2014, Intel’s chief security architect Ernie Brickell described the processor maker’s approach to protecting hardware and software from hacks and attacks. A research-focused session at DAC 2014 looks at using coupled oscillators rather than charge transfer to process data. 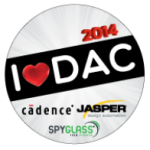 At DAC 2014, some 30 per cent of exhibitors are IP suppliers, offering design services or both, demonstrating how system-level design is about building on what has gone before.